The year 2000. What a time. It was a delightful year when, contrary to public concern, we all lived past 12:01 a.m. on New Year’s Day — which meant we lived long enough to see Super Bowl XXXIV. I do not know who played. I do not know who won. But I do know that 2000 marked the first year that internet companies went all-in on Super Bowl advertising. Compared to just two ads for websites in 1999, in 2000 nearly 20 percent of the 61 ads were purchased by dot-coms, according to SFGate. The going rate was $2.2 million for 30 seconds of air. Ah, yes, Computer.com. 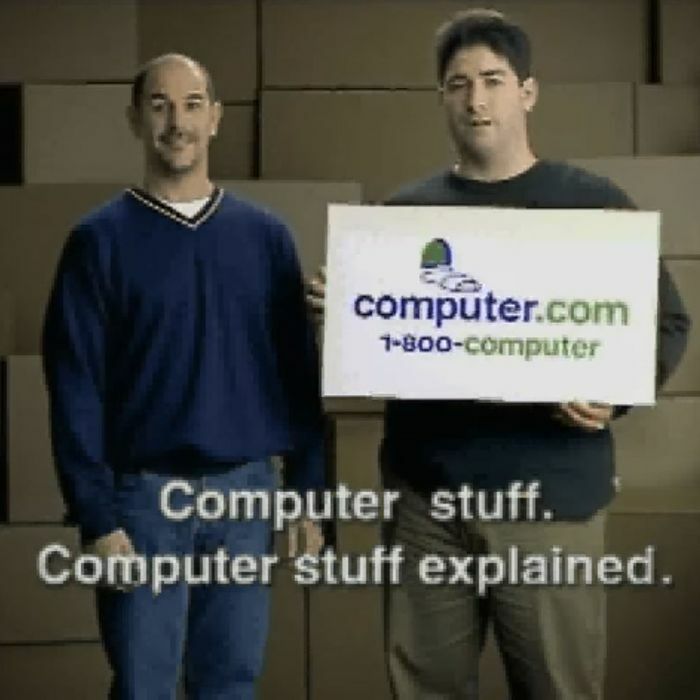 Where they sell and explain “computer stuff.” Which was basically the entire premise for this ad. Computer.com was later acquired by Office Depot. Autotrader, still in business, ran an ad entitled “I Need a Car.” It’s not the one below, but the spirit is mostly the same. There are people. And they need a car. Honestly, just watch this ad from Epidemic to figure out why they went out of business. “Include a link when you send an email … if your friend buys, you get paid.” This sounds totally not annoying and very sustainable. This spot, from online direct-marketing company LifeMinders, declared itself the “worst commercial on the Super Bowl” and was allegedly put together in a matter of days. LifeMinders was acquired by Cross Media in 2001. When I mentioned writing about the Dot-Com Bowl to one of my colleagues over on Vulture, this sock-puppet ad from Pets.com was the only one he could remember from 2000. Pets.com was liquidated in 2002, and CNET called it the “latest high-profile dot-com disaster.” This news came two years after the company’s IPO, where it raised $85 million. The bit here in this commercial from Netpliance is that every person wears a big pair of thick, black glasses with tape around the middle. What dorks! “Webheads,” if you will. Netpliance built a product called the i-Opener, which wasn’t a computer, but was a piece of cheaper hardware that would allow users to access the internet. Netpliance later rebranded and was purchased in 2005.